Baseline® hand dynamometers give accurate grip strength readings without the subject being able to "feel" the handle move. The results are consistent with the published Baseline and Jamar® studies. The internationally accepted design assures reliability, user convenience and measurement repeatability. The five position adjustable handle can accommodate any hand size. The maximum reading remains until the unit is reset. The strength reading can be viewed as pounds or kilograms. Each dynamometer comes in a molded carrying case. The unit is made in the USA. Items whose product numbers are listed in blue text (below) now come with a 2-year parts & labor warranty. The 200 lb. (90kg.) 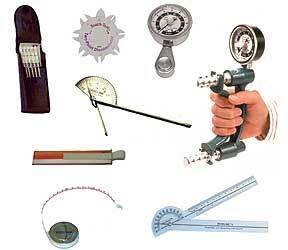 Baseline hand dynamometer is available with a standard or large dial gauge. The HD 200 lb. (90kg.) Baseline hand dynamometer (12-0221) incorporates the new "double-wall" bellows system that dramatically reduces hydraulic failure. (This product comes with a 5-year warranty and case.) The large dial has more measurement gradations and is easier to read. The 300 lb. (135kg.) 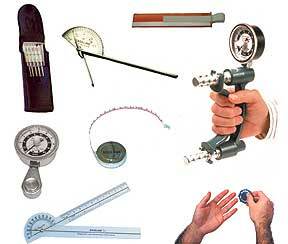 Baseline hand dynamometer is only available with a large dial. The 300 lb. (135 kg.) digital Baseline hydraulic hand dynamometer uses the same hydraulic system but has the added advantage of an easy-to-read LCD display. The digital version features an electronic zero calibration system that decreases the need for factory recalibrations, a power management system that assures at least 1000 hours of use without changing the 2 "AAA" batteries, a low battery light, and an automatic shut off. Push button console includes a button to zero the last maximum reading stored in memory, a maximum button to display the highest reading since the last press of the maximum clear button, and a lb./kg. toggle button to change the measurement reading. 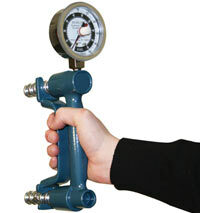 Baseline standard hydraulic hand dynamometer has a 200 pound capacity. Unit has blue body and 2-1/2" analog gauge. Unit has 2 year manufacturer's warranty. Baseline hydraulic hand dynamometer gives accurate grip strength readings without the subject being able to "feel" the handle move. The hand dynamometer provides instantaneous and constant biofeedback. The internationally accepted design ensures reliability, user convenience and measurement repeatability. Maximum reading remains until the unit is reset. Five position handle and body design yield results that are consistent with published Baseline and Jamar studies. The strength reading can be viewed as pounds or kilograms. CE Certified. Protective carrying case included. Baseline® hydraulic pinch gauges use the improved hydraulic system of the hand dynamometer to assure convenience, product reliability and measurement accuracy and repeatability. The therapist can support the pinch gauge during testing. This yields a more accurate result for all pinch tests (tip, key and palmer). The results are consistent with the published Baseline and Jamar® studies. The maximum reading remains until the unit is reset. The strength reading can be viewed as pounds or kilograms. Each dynamometer comes in a rugged carrying case. The unit is made in the USA. Items whose product numbers are listed in blue text (below) now come with a 2-year parts & labor warranty. The 50 lb. (22.5kg.) 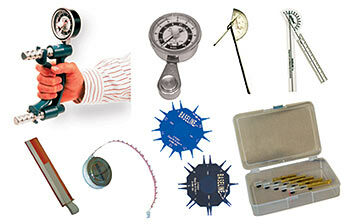 Baseline pinch gauge is available with a standard or large dial gauge. The HD 50 lb. (90kg.) Baseline pinch gauge (12-0222) incorporates the new "double-wall" bellows system that dramatically reduces hydraulic failure. (This product comes with a 5-year warranty and case.) The large dial has more measurement gradations and is easier to read. The 95 lb. (42.5kg.) Baseline pinch gauge is only available with a large dial gauge. The 100 lb. (45 kg.) digital Baseline hydraulic pinch gauge uses the same hydraulic system but has the added advantage of an easy-to-read LCD display. Digital version features an electronic zero calibration system that decreases the need for factory recalibrations, a power management system that assures at least 1000 hours of use without changing the 2 "AAA" batteries, a low battery light, and an automatic shut off. Push button console includes a button to zero the last maximum reading stored in memory, a maximum button to display the highest reading since the last press of the maximum clear button, and a lb./kg. toggle button to change the measurement reading. The 50 lb. (22.5 kg.) 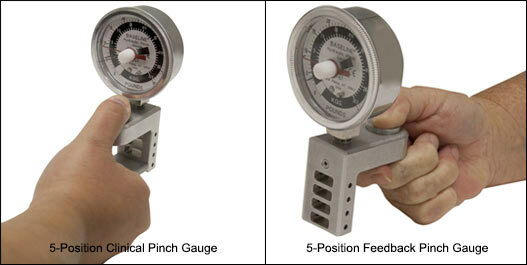 5-position hydraulic pinch gauge is available in 2 models. The adjustable handle fits all size hands for accurate and repeatable pinch measurements. 5-position strength test protocols (MVE and MMVE) now can be used for pinch measurements. Easy to adjust paddle accommodates to any size hand (other pinch gauges only have one pinch width). Pinch width without paddle is the same width as standard pinch gauges, both mechanical and hydraulic. Portable carrying case contains all instruments necessary to evaluate the strength and range-of-motion of the hand and fingers. Set includes hydraulic hand dynamometer (12-0240, 12-0243, 12-0246 or 12-0247), hydraulic pinch gauge (12-0235, 12-0239, 12-0228, 12-0237, 12-0480 or 12-0490) and stainless steel goniometer (12-1010). 12-0103 - standard dial 200lb./50lb. 12-0105 - large dial 200lb./50lb. 12-0110 - large dial 300lb./95lb. 12-0160 - standard dial 200lb./5-position feedback mode 50 lb. 12-0112 - digital LCD 300lb./100lb. Instruments needed for a full hand evaluation are stored in case. Grip strength is measured by the hydraulic hand dynamometer (12-0240, 12-0243, 12-0246 or 12-0247) and pinch strength by the 30 lb. (12-0200) or 60 lb. (12-0201) mechanical pinch gauge. Other measurements are made with the stainless steel goniometer (12-1010), 2-point discriminator with 3rd point (12-1481), Wartenburg pinwheel (12-1450), finger circumference gauge (12-1220) and functional finger motion gauge (12-1060). Baseline 7-piece standard hand evaluation set includes the following instruments stored in a protective carrying case: standard 200 pound capacity hydraulic hand dynamometer (blue), 30 pound capacity mechanical pinch gauge (blue), 6 inch stainless steel finger goniometer, 2-point discriminator with 3rd point, Wartenburg pinwheel, finger circumference gauge and functional finger motion gauge. Dynamometer and pinch gauge have a 2 year manufacturer's warranty. CE Certified. Baseline 7-piece LiTE hand evaluation set includes the following instruments stored in a protective carrying case: LiTE 200 pound capacity hydraulic hand dynamometer (red), 30 pound capacity mechanical pinch gauge (blue), 6 inch stainless steel finger goniometer, 2-point discriminator with 3rd point, Wartenburg pinwheel, finger circumference gauge and functional finger motion gauge. Dynamometer and pinch gauge have a 1 year manufacturer's warranty. CE Certified. 12-0100 - standard dial 200lb./30lb. 12-0104 - large dial 200lb./30lb. 12-0111 - large dial 300lb./60lb. 12-0113 - digital LCD 300lb./60lb.